This story originally appeared on Simcoe.com on January 29, 2019. There’s no such thing as a typical day for a micro-farmer. Last week, the well on the Stone Horse Farm froze over for the first time in the 16 years Lisa Peterson has lived on it. “I had no water and 100 thirsty pigs,” Peterson said, a plumber friend came out and lent a hand. Days later, a litter of pigs, the first of the season arrived, then days later another litter. Over the year, about 24 litters are born and raised on the farm. “I wanted my kids to eat the way I ate when I was growing up on a hobby farm,” Peterson said. Though she grew up in Minnesota, mostly around horses, her family raised pigs, chickens and occasionally cows. 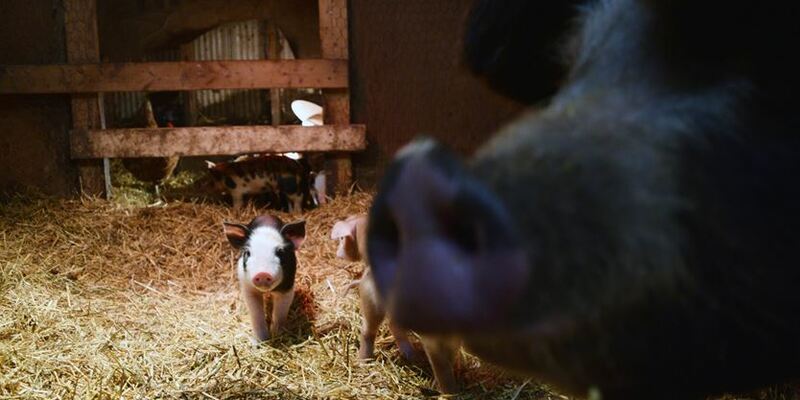 Peterson started with five piglets in 2011, bought from an old farmer a 20-minute drive away. “They didn’t do too much damage to my yard,” Peterson said, so the next year she raised eight piglets, then a dozen. When porcine epidemic diarrhea (PED) decimated the pork industry in 2013 and 2014, the price of pork skyrocketed. “Everyone with a little pen in their yard wanted to buy and raise pigs to make money,” Peterson said. 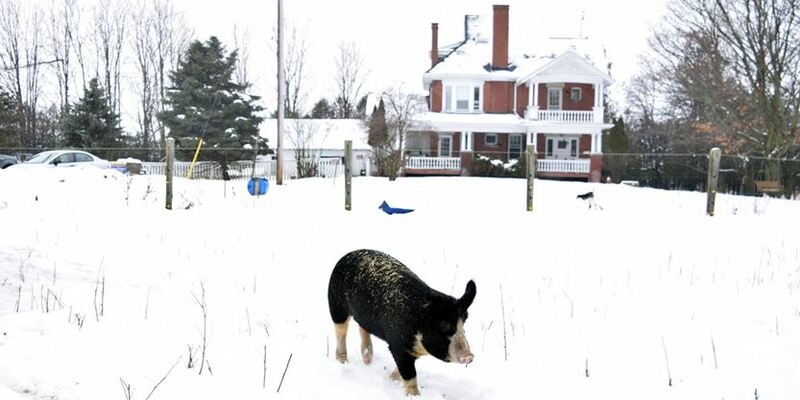 She ended up with five mean little piglets from a farm in Bancroft. After that, Peterson bought two sows and a boar and decided to breed her pork on the farm. Today, she ships about eight grown pigs a month to an abattoir in Harriston. There are 110 pigs on the farm, three horses, several goats, dozens of rabbits and countless chickens as well. For poultry, Peterson has to always be thinking a few steps ahead. When she started raising chickens small-time farmers were limited by the Chicken Farmers of Ontario to a maximum of 300 chickens each year. Eventually, the ceiling was raised and Peterson started raising 900 chickens in a season, and now 1,200. By 2020, she’ll raise 1,500. She could raise more, but raising the chickens is the easy part. “We have so few processors left in Ontario,” Peterson said, the abattoir industry in Ontario has shrunk from 500 across the province to 122 very busy shops. “They’re booked to the gills. I’m booked in for 2020 as of last October,” Peterson said. Most operators age out or their equipment does. Few young people are willing to take over the business and startup costs can deter even the most enthusiastic operators. Today, two fresh litters of piglets are huddling under heat lamps in one of the barns, the youngest litter just three days old. Often customers ask Peterson if it’s difficult to raise these downy piglets with their intended end in mind. 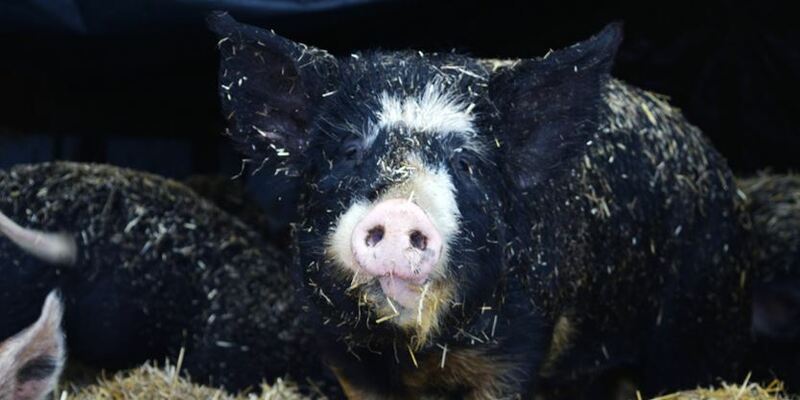 From birth until harvest, the pigs live particularly happy lives on the farm. They lounge in the barns, rough house and enjoy, among a long menu of nutritious feed, spent grain from Barnstormer Brewing. After Halloween, Peterson invited people to a “pumpkin pitch,” where visitors could toss their pumpkins into the pens to be eaten by the pigs. More than 1,000 people showed up and Peterson had to enlist help to manage the traffic. In December, the farm received a few tons of carrots. “They were pooping orange for weeks,” Peterson said. “Pigs get 45 per cent of their nutrients from grass,” Peterson said. Aside from treats like pumpkins, carrots and spent grain, she feeds the animals nongenetically modified barley. “The meat is healthier, it’s got a bigger variety of minerals and nutrients than if they were on a standard two-ingredient diet,” Peterson said. This year, Peterson said, she’s going to finally make a middle-class income from farming. By processing the meat and selling directly to the consumer, Peterson said she can bring in about $10 per pound of meat. Though, not selling live pigs to a middleman has its challenges. While traditional and back-to-the-land techniques mean a high-quality product for the farm, staying current helps draw in business. “Facebook is the only reason I’m still here,” Peterson said. Stone Horse Farm sells out of the Barrie Farmer’s Market, the Thornton Farmer’s Market (started by Peterson last year), and the Innisfil Farmer’s Market, though customers are welcome to visit the farm (3869 7th Line, Innisfil) by appointment.